Smoking Decade will satisfy any subconscious death wish you may harbor. S/he wants women to buy Decades. Like the previous Parliament cigarettes ad, this ad uses browns and oranges - fall colors; fall being the time of year when many plants die back and prepare for winter. Once again the planet is barren and we see a setting sun. However, in this ad there is one living thing visible - that tobacco plant looking quite healthy near the horizon. Maybe that part of the message tells us, "In the world of death it brings, tobacco lives on." Finally, look at the big D on the package. The phrase "the Big D" was at one time a relatively well-known euphemism for death. Maybe it still is. 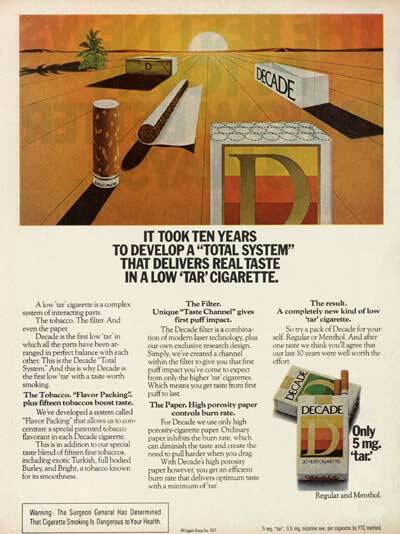 I don't recall that Decade cigarettes survived in the market place for very long.